When back surgery is necessary to correct spinal deformities, stabilize and strengthen the spine, or facilitate a fusion, implants are often inserted to achieve one or more of these goals. While the design of the spinal implant matters, so does the material used to make the implant. Each type of spinal implant has a different purpose, which dictates what materials are likely to be used during the manufacturing process. Since hooks, rods, plates and pedicle screws need to be as stable as possible, some type of metal is often used. With cages, however, carbon-fiber-reinforced composite allows for natural bone growth. A major consideration with spinal implants is how durable such implants will be after being inserted into the patient’s spine. 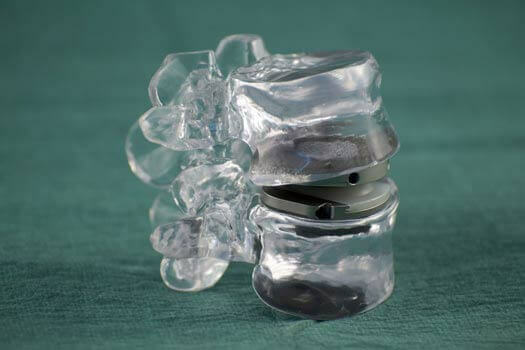 In some cases, a plastic bearing surface is included with the device to protect the inner structure of the implant. Titanium and stainless steel tend to be the most durable materials used for implants. Most implants used are designed to closely reproduce the natural mechanics of the spine and related disc materials as much as possible, especially those used in spinal fusion surgeries. For this reason, some degree of flexibility is usually necessary to allow for natural movement. With artificial discs used in disc replacement surgery, for instance, some type of metal is used for the outside of the disc while rubber polyethylene is used to replicate the soft inner core of the disc. Weight is also an issue. Titanium, for example, is half the weight of stainless steel, explaining why it’s often the preferred metal used for spinal implants. Titanium is also highly resistant to corrosion, which can further extend the life of implants. According to the American Academy of Orthopaedic Surgeons, most spinal implants (including related hardware) are manufactured using a combination of pure titanium, titanium alloys, and stainless steel. Since the exact chemical composition of spinal implants can vary, patients can get information on the implants that will be used in their surgery from the orthopedic surgeon doing the operation or someone on his or her staff — or get the part number from the surgeon and search online. If you’re considering back surgery and would like a second opinion, turn to the dedicated diagnostic team at The Spine Institute in Beverly Hills. One of our experienced board-certified physicians can determine the cause of your pain and help you understand all the treatment options available to you. Call us today at (310) 828-7757 and request an in-person consultation.